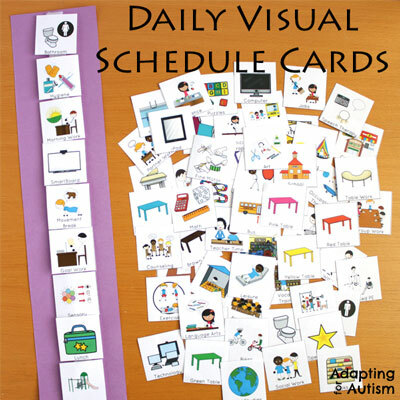 Visual schedules are a staple in autism and special education classrooms. Schedules help our students understand their day and reduce anxiety about what’s next. However, if we don’t follow them relatively quickly and efficiently, we have less time on task. And we have A LOT of work every day! Match points give students a physical target to make following their schedules a very concrete task. Most of my students use picture schedules. 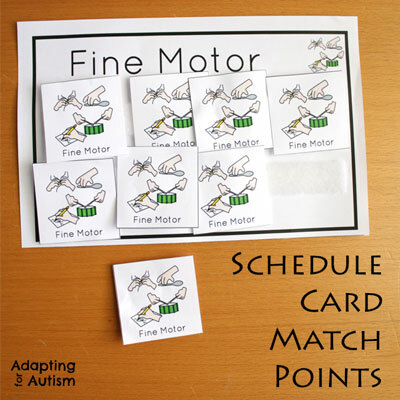 More specifically, two inch square cards with one activity represented by a picture and the word. Students can see their entire day (or sometimes half of the day) on one long strip. When students check their schedule, they take the top picture card. They carry it to the next location whether that is to another place in the classroom or out of the room (lunch, bathroom, art, etc). Once they reach their destination, they match their card to a ‘match point’ that’s posted at the station or on the door when out of the classroom. The match points have the same word and picture as the individual schedule icons along with a few strips of soft Velcro. The primary reason for carrying the picture to the next location is so they have a visual and tactile reminder of where they are going! Some transitions within the school building can take several minutes. If a student checks their schedule and then immediately places it in an “all done” pocket or on an attached “finished” strip (which is false anyways), they may forget what they are supposed to be doing. Bonus – it gives the student something to do with at least one of his hands! While teaching this routine, you can start with a hand over hand prompt. You can quickly fade this to a verbal “match” and pointing with your finger. 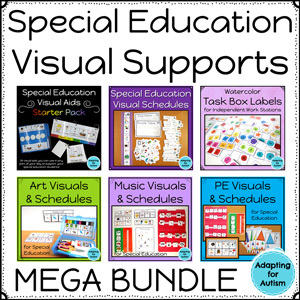 With so many ‘trials’ each day, your students will learn the routine easily. The only time I have to remind students to match is when they come into the room eager to see the activities I set up! I even created a match point for the community bus! When our community trip is over, each student gets a bus icon to match when they return to the bus. The matching routine is so strong, we transition better (note I didn’t say we transition well…but better than when we don’t give students bus icons!). 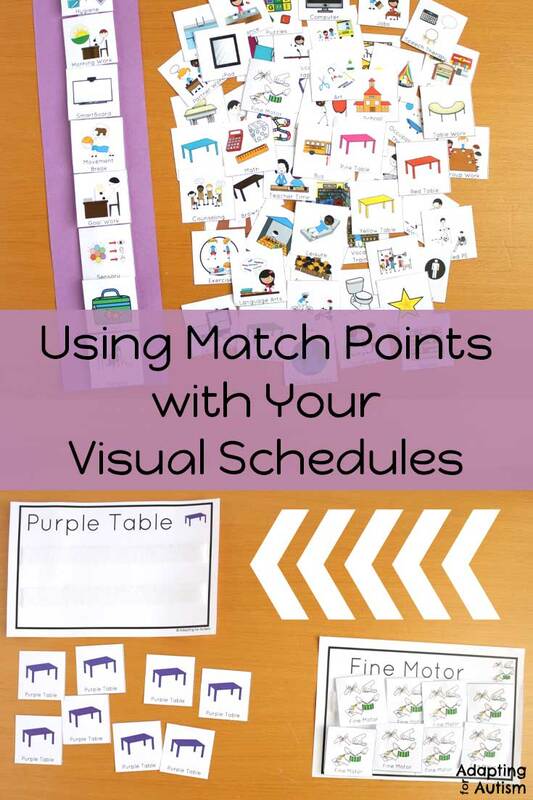 Match points are a part of my Visual Schedules Bundle. I’ve done the work for you with these whole class schedule strips, individual schedule cards and match points. 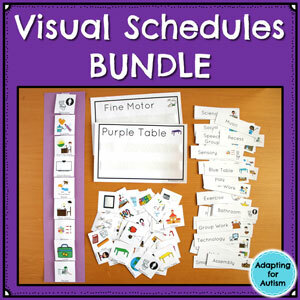 Check it out in my Autism Work Tasks store.